I know what you are thinking. What the ^&*$% is a moodling? I get that question a lot. Click here to learn the whole story. 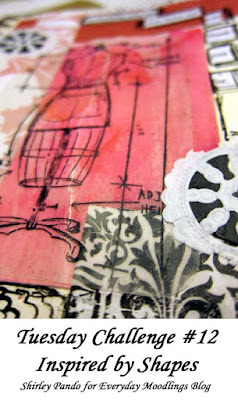 Hey crafter's! Shirley Pando here for Tuesday Challenge #12. This week our challenge is to be inspired by a shape. Maybe to you that means squares, circles, rectangles, or hearts. It doesn't matter. Pick your shape and use it in a project this week. Stuck for inspiration? I've got quite a few ideas for you. Keep reading! Do you ever get stuck? You want to create something. 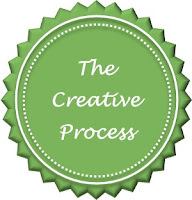 Maybe you have carved out for yourself a chunk of time and (finally!) 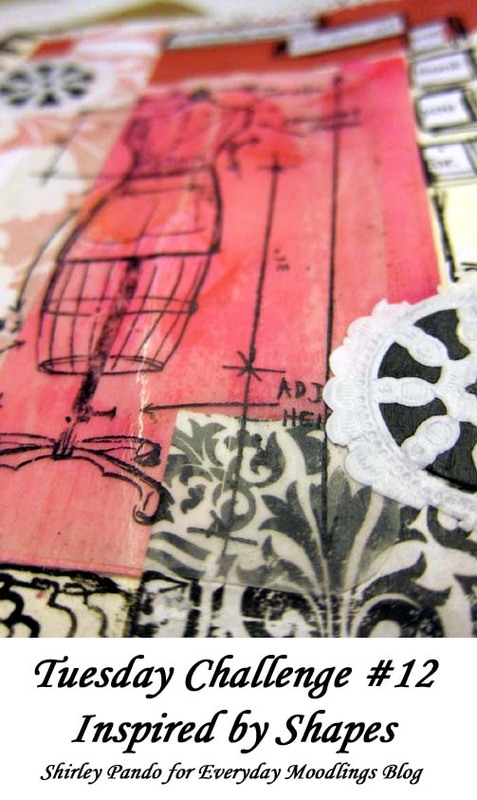 are sitting in your art studio...a room full of supplies - patterned paper, paints, embellishments...but nothing is popping into your head. Well, I am sure we have all been in such a spot at least once (a month!) But not to worry. There are loads of places to find inspiration. Sometimes you just have to look. Other times you have to "look harder", as the great Mufasa said to little Simba in The Lion King. In order to help us on our journey to find shapes as inspiration, I've started a list of great places I often look to find inspiration. Your craft supplies - Yep. We loved them at one time enough to purchase them. There's "gold" in those supplies. Pinterest - Need I say more? Personal photos of your family, home, pets, etc. Clip art images - Some of my favorite places to find images are The Graphics Fairy, Karen's Whimsy, or sign up for the newsletter at Dover Publications and receive free downloadable images. Sketches - Here are some for cards, and for scrapbook pages. Television commercials - My personal favorite right now is the Coke commercial with the lady...almost flying - reaching for the diet Coke bottle, as Andra Day sings Queen's "I want it all, I want it all, I want it all, and I want it now". Shadows - Take photos of shadows on your neighborhood walk. Magazines or catalogs - Always a favorite of mine. Fashion - One word...Polyvore. It is the "Pinterest" of fashion. Architecture - Gates, porches, steeples, stained glass, turrets, etc. For my project this week I'm inspired by Interior Design. 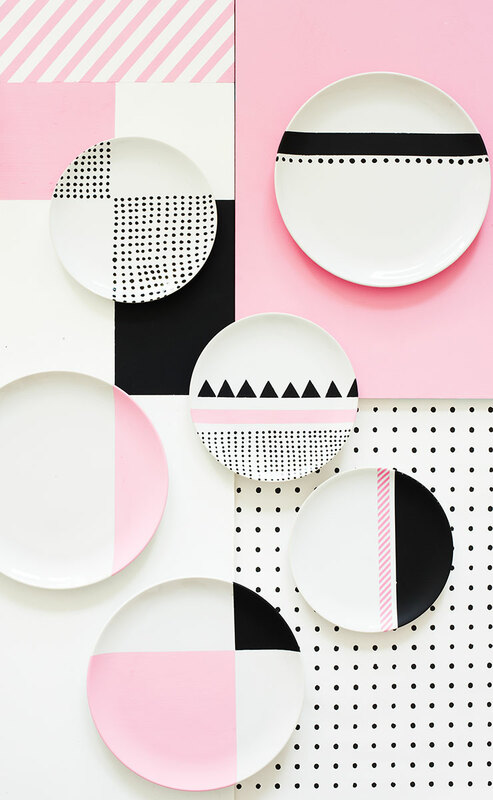 I love this styled photo of dinner plates by Charlotte Love, interior stylist and set designer. 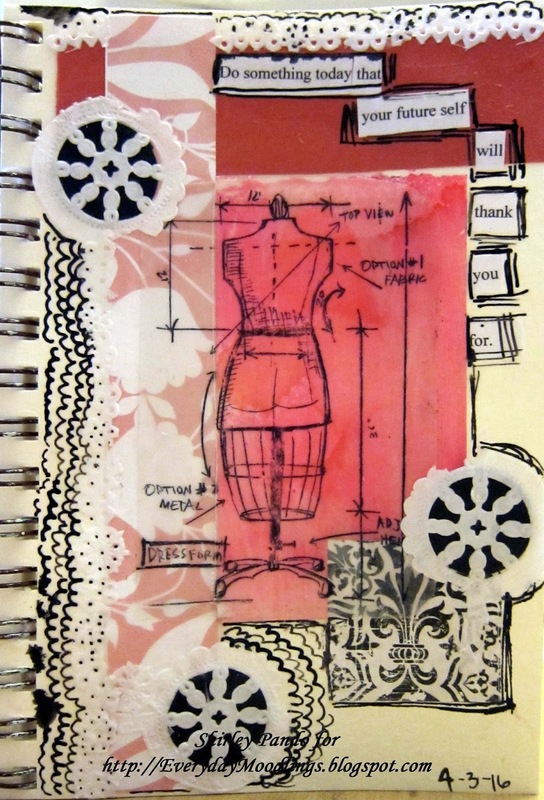 And from that design, I was inspired to create the collage in my art journal. No, it is not an exact representation of the photo/design. It is a project inspired by it. 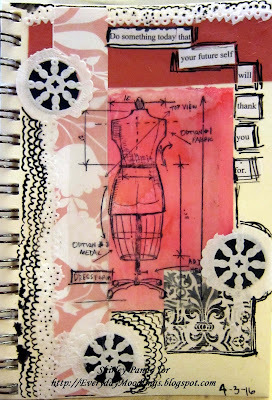 That means that I took the feel, and/or the lines, and/or the color, and/or, in this case, the shapes, and created a collage/art journal page. Check out the video for a look at how I created it. In my latest workshop we'll learn to find inspiration from what you see every day, and take those ideas and translate them into projects. Come join us! Make sure to comment, below, and let me know some of your favorite places to find inspiration. Comparing five different dimensional adhesives, including Glossy Accents and Diamond Glaze. I am on a mission to find the best dimensional adhesive. Come along as I share my results. Never clean a stencil again! One week only! Color Inspiration workshops are $10.